Cirkewwa reef/wall continues to northerly direction well beyond tugboat Rozi wreck and Cirkewwa Arch. This part of the reef is commonly referred as Reef Beyond Rozi or Right Reef. This is a technical dive with maximum depths over 40 metres. The top part of the reef stays around 15 to 20 m mark, but roughly after 10-minute swim from the Cirkewwa Arch the sandy bottom starts to slope down and the wall gets steeper. At this point the reef splits in two. The shallower reef stays on 15 to 20 metres depth and start slowly to turn eastwards, while the deeper reef/wall continues towards northerly direction. 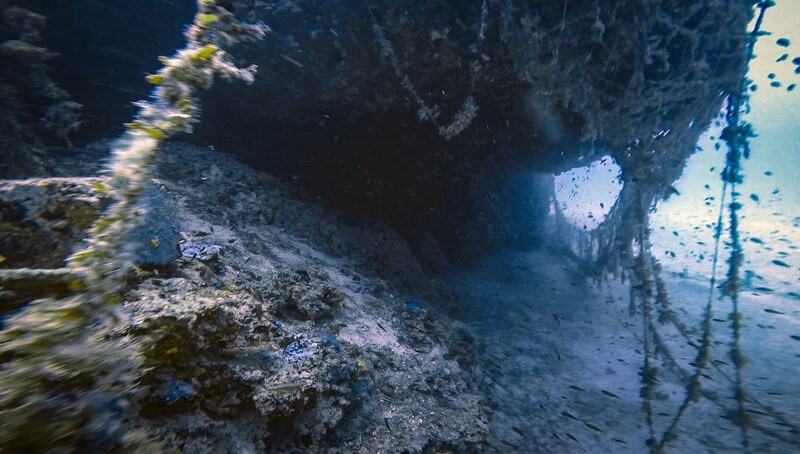 The top part of this northern reef quickly drops to around 30 m, and the wall meets the sandy bottom at depths beyond 40 m. This deeper reef has interesting caves and overhangs with nets entangled on it. Warning! This is challenging dive site. Be aware of the depth and time as it's a long swim back to shore. The area is often exposed to strong currents, and the Gozo ferries pass close by the deeper wall, so direct surfacing from the depths is not an option. Do not attempt to dive this reef with recreational dive gear. ★★★★☆ Long swim and a bit difficult dive to plan, but well worth it.